SOUTHERN REGIONAL RAMBLES. 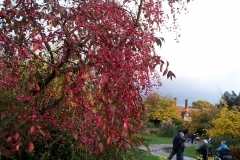 WISLEY AUTUMN RAMBLE – 17TH NOVEMBER 2014. This is our third visit to Wisley, and it is always different and just as enjoyable. 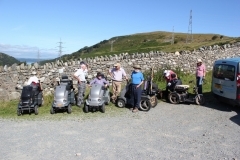 We had 9 scooters and 7 walkers, and were delighted to see Eileen Hole and her family there. The super thing about these rambles is that it brings people back into contact with old friends and that is one of the most rewarding things. The fact that our members make the effort on such an unpromising day is greatly appreciated, and luckily we were rewarded with nice weather later in the day. The staff there are so helpful and friendly it is a pleasure to visit. We are allowed to park in the coach park so that we don’t have problems unloading and they try to ensure that as many as possible are able to gain entry as economically as they can. It was a grim, rainy day on the trip up but almost as soon as we got there it stopped raining and we only had a little shower during the ramble that necessitated getting togged up, and after that it was very pleasant – rather grey until after lunch but then as the afternoon progressed we had some lovely sparkling sunshine that showed up the Autumn colours to perfection. We went round the ornamental lakes in front of the house and through the walled garden, on to the Alpine Houses and rock garden taking the trail through the trial fields and fruit collections, and back to the very beautiful Glasshouse and restaurant for lunch. The Glasshouse is home to many tropical plants and is really interesting and is massive, a bit like a mini Crystal Palace! After lunch we went through the Pinetum, which is an arboretum of many varieties of coniferous and deciduous trees and on along the path which follows the river Wey running alongside the northern edge of the gardens. The Autumn colours were very impressive and with the late afternoon sun it made a very satisfying seasonal picture. There were a lot of fungi, a few of which can be seen in the photo section, it appears to have been an excellent year for fungi and if only we knew which ones were safe to eat it would be wonderful, but too risky to chance. Then it was time to return, some of us went to browse in the plant shop and some in the gift shop and 5 of us went on to have a delicious evening meal at the Anchor pub by the side of Pyrford Lock just up the lane before the trek home. A really good day, thanks to all who came, .........now to plan the next one!!! Val R.
30TH OCTOBER. 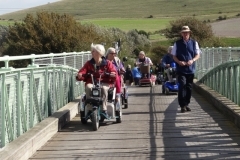 After the very wet conditions of the previous day we were delighted to awake to perfect weather for this very popular ramble at Hengistbury Head. 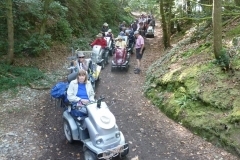 21 scooters turned up and we all set off for a super day with splendid scenery in every direction. 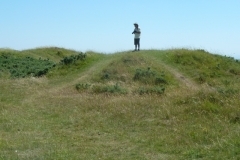 This is a nature reserve and was an ancient Hill Fort, it leads onto Mudeford Spit with some of the most expensive beach huts in the country – one sold not so long ago for £200,000 – almost unbelievable! It is a unique situation as on one side of the spit there are views out across the bay to Christchurch, Barton-on-sea, Milford-on-sea and the Isle of Wight and on the other side of the beach huts there is a beautiful sandy beach with views out to sea and also across Poole Bay all the way to Bournemouth and beyond. We had a coffee break here, it was like being abroad in a way with the wonderful views, boats bobbing in the bay and all the activities that go on, and the sunshine! We then retraced our steps and went up onto Hengistbury Head where we had lunch, luckily, there was hardly any wind – it can be extremely blowey up there sometimes – so it was very pleasant and the views are even more amazing along the Dorset coastline. We then explored the general area along the various tracks and trails and alongside a series of ponds, apparently these are home to the rare natterjack toad (but we didn’t come across any). 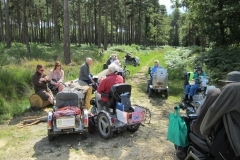 On our return we all congregated at The Hiker cafe for cakes and tea before going home. 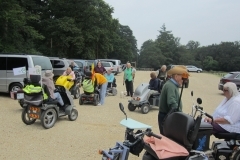 It was great to see so many of our members, and friends, there – it is much appreciated that people come so far to attend the rambles and it is nice to see that everyone gets a good and enjoyable day out. Thanks to all for coming to the Southern Autumn Tour and to everyone involved in planning and holding the ramble and all those that helped on the day to make it a success. 29th October. This ramble showed just how intrepid (some may say mad!) 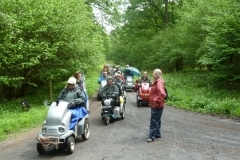 we Disabled Ramblers are. 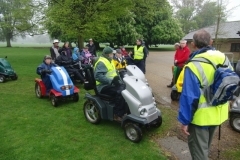 It was a dismal day, pouring with rain but 19 scooterists turned up at Bolderwood for the start of the ramble, all togged up in waterproofs and with a philosophical outlook. We started off very well but when we got to the beautiful little ford and bridge en route we found it was impassable because the Forestry Commission, in spite of being informed of the planned ramble, were replacing the planks, the ford was not possible to cross because of the muddy conditions and amount of water in the stream, so there was no alternative but to turn back and retrace our very wet wheel-marks! Luckily, in that particular area there was a choice of tracks to various other lovely parts of the Forest, so the Leader chose a different route to Cadmans Pond and we headed for that instead. Unfortunately, we had already had to stop and wait for a late arrival of a member (but they never arrived in the end) so some of us were really wet by then and chose to return to their cars and head for warmth. This left 10 of us to continue the ramble. To our relief the rain did lessen by mid-day so we had lunch at Cadmans Pond, which is a very nice area with ducks, geese and ponies all around. We left Cadmans at about 2 o’clock by which time a quite dense mist had descended on the forest, so we all had all our hazard lights and headlights on for the little bit of road we had to travel along before we could enter the inclosure for the return trip. Even with the mist the forest is marvellous, it gives it a mysterious quality – I love it! Of course, the view is not so good when misty, but we got back safely, and wetly! In spite of the conditions we had a very good time and were all in happy frame of mind but were looking forward to getting the waterproofs off and having a lovely cup of tea. Thanks to all for continuing with the ramble, it was fun. 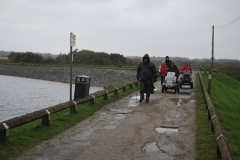 Lancs Regional Ramble around Roddlesworth Reservoir. Hurricane Gonzalo gave some cause for concern - would our way to Roddlesworth be blocked by debris - would the woodland paths be blocked by fallen trees had the forecasters got it right - would the wind have died down enough to make our walk possible. We got out the winter woollies and headed for the hills…and were not disappointed. Tarja arrived with the Lancashire loan scooters and we set off down into the woods now awash with Autumn colours. A stony track through an avenue of yellows, orange rust and green glistening from the earlier shower. Lorraine, the R.O.W. officer from Blackburn had cut back the overgrown shrubs and brought with her the key to the gates we had struggled around on our earlier reccie. There was good natured banter between ‘Lancashire’ and ‘Yorkshire’ as Lynda and Dave had come over from Sheffield to join us. As a Rochdale man Owen was sitting quite close to fence! Less chat and more concentration. There was a tricky stretch as we had to join the A675 Bolton Road, this is a busy road with a pavement on ‘our’ side but the grass had grown over the tarmac and it tilted the Trampers towards the traffic. 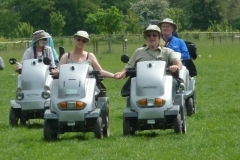 Luckily we had walkers Robert and Rosie to help with slowing the traffic until we could reach Abbey Village. Here we could turn into the safety of road that crossed the reservoir dam. A nice easy run after the ruts, puddles and mud of the woodland lanes. We sheltered under the trees in the fishermen’s car park while we had lunch with a cheeky robin looking out for tasty crumbs. We spared a thought for those who were not with us. Clive and Andrew who died in September and Laurence who had an op. We wish him a speedy recovery so that he can be out with us again shortly. We crossed the footbridge and followed the river and run off for the dam wondering at the engineering feat that had reshaped the landscape but yet still keeping it looking natural with its surroundings. We were grateful for the shelter of the trees as we rounded the reservoir and climbed back up through the woods as the weather closed in. Sheets of rains blowing across the water. No more than a little damp we got back to a cup of hot chocolate and piece of cake at Vaughn’s café feeling we had had a good day out. Many thanks to Tarja Wilson, Lorraine Mellodey, Joe Grima from United Utilities, and our walkers Robert, Rosie and Dave. Your help was very much appreciated. 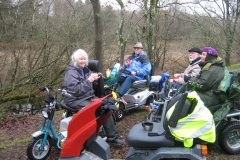 Todays’ Tramper riders were Eileen, Owen and Lynda (newbie! Well done!) 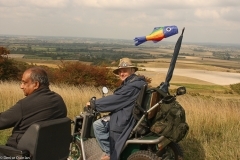 Eileen T.
THE EGRETS WAY – 25TH SEPTEMBER 2014 This ramble came about as the result of the opening of a new pathway linking the two pretty villages of Rodmell and Southease in East Sussex, near Newhaven, earlier in the year which we attended on behalf of DR who supported the project in its initial stages. 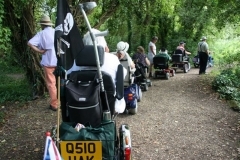 It is eventually hoped to link up with Lewes by continuing the path as it is at present. It is a flat and easy ramble of about 5 miles through the beautiful East Sussex countryside of rolling hills, reed beds, cattle feeding in the fields and the lovely white cliffs that abound in this area. 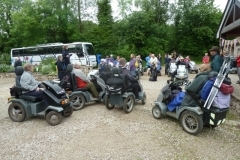 9 scooters and 3 walkers turned up including Sue, the Secretary of the Ouse Valley Cycle Network which was set up to mastermind the Egrets Way project. We were also particularly pleased to welcome John and Judy, long standing members of DR, who haven’t been able to get to many rambles recently, and Celia with Phoebe the chocolate Labrador and not forgetting Nomi – super to see her out again after not being too well over the summer. It is great to welcome all who come but it is very rewarding to meet new faces and see old friends again. We started off with coffee and cakes at the YHA which is at Southease Station, and proceeded over the bridge that crosses the Ouse and onto the pathway itself, which follows the R Ouse for a good way through lovely open landscape. The weather was perfect and we had the “big” skies that are so famous in E Sussex. A good picture of Colin keeping two gates open at the same time and also taking a photo of Bob taking a photo of him!! We got to Monks House at about 1 o’clock and entered the garden by the side gate. It is a lovely peaceful garden and interesting house, and this is where Virginia Woolf and the Bloomsbury Set entertained each other in the early part of the 20th Century. Well worth a visit. We then trundled up the very pretty village of Rodmell with its roses round the doors and the ancient cottages and buildings. It also has a lovely old church that Sue and Colin and Paul had a peep into, we will explore that next time. The journey back was linear but we were entertained by a plane doing a few stunts, of course, I arranged that specially for the day! We got back at about ten to four and had more cakes and cups of tea in the YHA, which is very modern and welcoming. 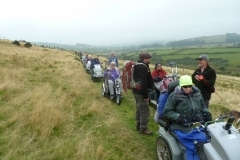 In all, a very enjoyable day with great company which is what disabled rambling is all about – to get us all out into the countryside and have a jolly good time! 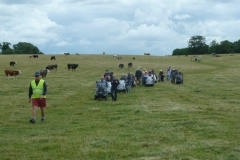 Thanks to all who came and to all who couldn’t make this time because of holidays – your chance will come as we hope to put this ramble on again next summer and visit the two ancient churches that are on the route, one at Rodmell and one at Southease. Val. From the same car park as our first Devon ramble, we headed south along the line of the former railway to Morwellham Quay, a restored port on the River Tamar made famous as the location for ‘Edwardian Farm’ one of a series depicting a year in the life of farms in bygone times. In the last mile to the quay we dropped steeply 450 ft to sea level – and had to climb back up this later! 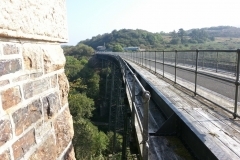 Starting with a visit to the railway legacy of Meldon Viaduct, spanning the West Okement river valley at a height of 120 feet, we then went back west along the Granite Way. This is the track-bed of the former London & South Western Railway. Leaving this we climbed steeply along the Two Castles Way to the high moorland of Sourton Tors, where in the 1870s ponds were formed so that winter ice could be cut and sold to the Plymouth fish trade. Unfortunately not a successful enterprise as a series of mild winters was followed by the introduction of refrigeration. Continuing to the Trig point on the summit gave spectacular views all around. Thanks to rangers Rob Taylor and Bill for their assistance and information. Although the landscape around Challacombe appears wild and natural, this quiet moorland farm has been inhabited and cultivated for thousands of years. Over time, people have changed and shaped the land; terraced the slopes, constructed boundaries to divide it up, carved out the streams, erected monuments on the hilltops and built in the valley. Min, the amazing lady who, with her daughter Naomi and son-in-law Mark, farms this remote area, was, as ever, delighted to welcome us and extended an invite to all members who would like to return. Ranger Bill Allen was a font of knowledge, imparted as we rambles up to the Golden Dagger tin mine then into Sousons Forest. Lunch was at the delightful Runnage Bridge and the return via a little used path in the woods will be forever remembered by some of our members! Dartmoor has long been used to train our armed services. 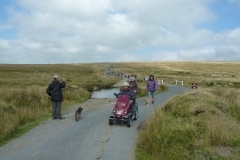 A whole series of tracks criss-cross the area to service this training but are all brought together at the Dartmoor Ring Road (or Loop Road or Circular Road) Once open to all traffic, it is now only used by the military and by walkers. The surface is a mixture of tarmac, fine gravel and rough gravel. Today it was suitable for Cat 2 scooters as the one ford we had to cross was shallow. The Ring road also gives access to Dartmoor’s highest peak at 2,037ft – High Willhays and the adjoining Yes Tor which is only about 6ft lower. We left those for another day. Most of the route out was a steady climb but there was 500ft of climbing in the last 1 mile before lunch at OP 15 (Observation Point). Downhill almost all the way back. Many thanks to Ranger Ian Brooker for all the information he provided. Lacking wood, peat was the main fuel on Dartmoor. The damage caused to the landscape can still be seen at the Rattlebrook Peat Works. The tramway used to take the Peat to Bridestowe station via a combination of horse drawn trucks and a railway formed our route today. At one time, a Naphtha works at Rattlebrook distilled the gas produced from the peat to produce candles, mothballs and gas for lighting. Our ramble began at the excellent Fox & Hounds and rises steadily past Great Nodden hill to Coombe Down. Cat 2 up to this point. Here it executed a hairpin turn and passed between Woodcock Hill and Great Links Tor. The track now become quite difficult but just over the brow of the hill we were rewarded with a view of the remains of the Rattlebrook Peat Works. From here a track led to the ruin of Bleak House - unfortunately only one walker got to the remains of this remote outpost. Many thanks to ranger Rob Taylor for imparting his wealth of knowledge. It was copper mining that made the Tamar Valley internationally famous in the 19th and early 20th century. The whole of the Tamar Valley was transformed through mining and the work that followed, such as the construction of transport networks and quays. The mine chimneys now form part of the local scenery, as well as hidden quays, overgrown tracks, half-visible mine adits, and barren hillside spoil-tips – all waiting to be discovered on this circular ramble. 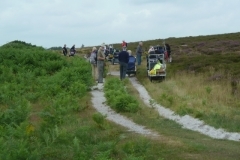 SOUTHERN REGIONAL RAMBLE HEATHER TRUNDLE, SHATTERFORD BOTTOM, NEW FOREST – 23RD AUGUST 2014 This was a new route through an area of heathland, ancient woodland and inclosures – principally to see the heather in bloom but also to savour the lovely atmosphere and forest landscape along the way. The New Forest offers much diversity of views and the rambles are, almost without exception, a delightful and rewarding experience for all. We started off from the car park at Shatterford with an attendance of 15 scooters and 5 walkers, including (for the first time and after much arm twisting) my daughter, Wendy, and her husband, Steve. We proceeded along a rough-ish path to Shatterford Bottom, a boggy area but there is a boarded bridge and walkway over the bog, and usually we pause and watch the dragonflies and damselflies flitting over the pond which is there, however, the sun had gone in and so had the pondlife and as we had just negotiated an area of fairly tricky sand everyone was pleased to go on into the wood and have a pause and little coffee break, so the dragonflies were given a miss this time!! We then proceeded through this lovely old wood and had to limbo under a tree that had fallen over the path. On the reccy we had to saw a branch off this tree in order for the ramble to proceed and we were watched with interest by about 8 lads who very sweetly offered to lift our scooters over the tree, but we explained that removal of the branch was essential for our ramble. Reccies can be a lot of fun, as well as a challenge and you meet some super people along the way. From there we proceeded through the wood, fairly tricky in places but we managed, and into the inclosure that leads through Denny Wood. In this inclosure there is a lot of insect life – dragon and damselflies and butterflies of many species and also we usually see some deer and we were lucky enough to see two or three this time, as well as about 5 ponies and their foals grazing. We found some nice logs for the walkers to rest on for our lunch stop. Then on up past Denny Lodge, a Keepers house, and through another track into some woods that leads back onto the heathland on the return route to Shatterford car park. The heather was just “going over” but we still got the fragrance from it as we passed. Once there some of us did a further “loop” over quite uneven and rutted ground across the road from the car park, this leads across a large, open plain where sometimes up to 100 cattle and ponies graze, and in the past we have seen grass-snakes and lizards run across the path. It then goes into another ancient and peaceful wood, Matley Wood, this area is impassable in the winter so we have to make the most of the summer and early autumn. Shatterford is next to Beaulieu Road Station and this is where the New Forest pony auctions are held and 7 of us later had a light meal in the Drift Inn – Drift is the name they call the rounding up of the ponies for sale as well as branding, veterinary attention and tail trimming and the drifts are a spectacular sight with the Verderers on horseback herding the wild ponies into the pens. 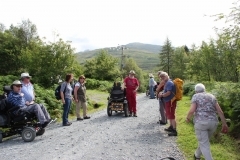 The weather on the day was sparkling and sunny, but quite fresh – but perfect for this ramble. It is on my list of “favourites”! 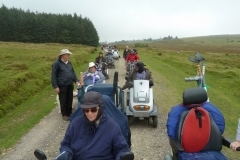 It was great to have so many there – many thanks to all and hope to see you next time – which is................The Cream Tea Ramble on the 5th of September. Regards to all, Val. Today’s Regional Ramble started at Knott End at an early 9.30. 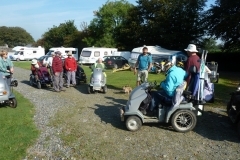 Five Trampers arrived from Wyre Council with two Rangers by ten o’clock and after a few phone calls it was clear there was a bug about and one member of the Disabled Ramblers was in hospital. So the four of us set off along the River Wyre until we could go no further. Then across the golf course – it was Lady’s day as it was Thursday. 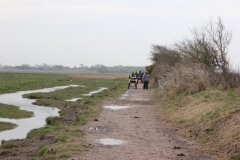 Then onto the salt marshes, along sea defences, onto farms and forgotten tracks leading to a disused small gauge train track known as the Pilling Pig. We carried on along tracks and lanes in a circular ramble back to the car park at approximately 2.15. The weather gods smiled on us; just small burst of rain on us but as we were in are cars the rangers got very wet loading up their Trampers. A big thanks to Duncan and his team. Cheers, Andrew Cross. Leaving from the Dutch style Ashdown House built in 1662 by Earl William Craven as a house fit for the queen he loved, Queen Elizabeth of Bohemia, we wandered through the deciduous woodland of the estate before taking to Green Lanes leading to the Ridgeway and Wayland’s Smithy where we were well entertained by National Trust ranger Andy Foley with the legends of Wayland as well as the archaeological findings from the Barrow. A wonderful lunch spot. After lunch we returned to the Ridgeway traveling west before heading south alongside an enormous field of wheat. This area was an airfield in WW2. Passing back through the Ha-ha the long drive back down the Avenue was enlivened by Sue J and Sue R having a race on their Supersports – brought on by memories of the original use of the Wenman Trophy as a prize for the fastest crossing of the Ridgeway end-to-end over two days as told to us by Wenman’s salesman Bob Owen who came on the ramble with us. The race ended in a draw. Moving on to Warnage Wood at Wadborough, we located the area of trees dedicated to the memory of Mike Longbottom. We were delighted that Mike’s daughter, Georgina, and a large group of her friends and family were able to be with us as Mike’s friend Tom Bindoff gave us a moving insight into the life of Mike. Then to the Cross Keys to celebrate an excellent days rambling. A ramble through this ancient Forest taking in many of the smaller tracks as well as the wide roads through the area. Easy going with plenty of rest options. 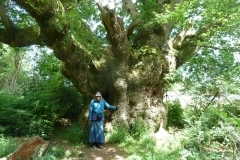 Many ancient oaks planted specially for the construction of warships centuries ago still exist and have their own names – Big Bellied Oak, Queen Oak, Saddle Oak and Spider Oak for example. We will visit some of them and admire their wonderful shapes. Look out too for rare lichens and fungi, Hawfinches, Redstarts, Nightjars and Red-tail Kites. There are 11 different species of bats known to visit. Situated on an undulating chalk plateau high above Marlborough on the extreme north east edge of Salisbury Plain, Savernake consists of 2,300 acres of mixed woodland managed by the Forestry Commission but is privately owned by the Earl of Cardigan – the only privately owned forest in Britain. Not many photos as we were caught in a downpour in the afternoon. 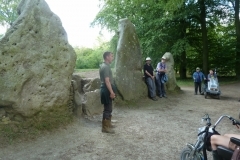 We trekked across Salisbury Plain from Woodhenge to Stonehenge. The true meaning of this ancient, awe-inspiring creation has been lost in the mists of time. Was Stonehenge a temple for sun worship, a healing centre, a burial site or perhaps a huge calendar? How did our ancestors manage to carry the mighty stones from so far away and then, using only the most primitive of tools, build this amazing structure? Surrounded by mystery, Stonehenge never fails to impress. 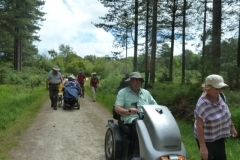 This again was a very varied and interesting ramble starting on heathland known as Godlingston Nature Reserve, going through beautiful forestry and then on up to Ower Bay with views over the estuary of Studland, Green Island and Poole Harbour. Then through farmland back to the start. Nine Barrow Down is a ridge overlooking the Isle of Purbeck, with Corfe Castle in constant sight. There are panoramic views over Poole Harbour on one side and wide sweeping sea views and Swanage on the other. 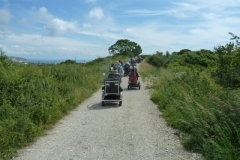 This is a linear route but journeying back gives a stunning view of the spectacular landscape of the Purbeck Hills. Some fairly steep, grassy slopes make this a possible 2+. The going is good on tracks apart from this. This was a ramble over the heathland of Middlebere Heath near Studland Bay on the Purbeck Hills. 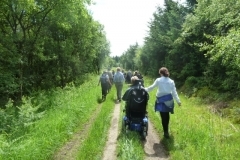 A very varied ramble through woodland and meadows, with a diversion for coastal views. The iconic Corfe Castle is in constant and ever changing sight. Just the beginning was a little tricky – so we took a different route. This ramble took us from Langton Matravers, a little village in the Purbeck Hills, through meadows, valleys, cliff top and into quarries, with glorious coastal views from over the surrounding area and looked down onto Dancing Ledge a bay famous in the locality, and the coast - towards Swanage one way and St Aldhelm’s Head the other. More than 3 metres tall, Ana (Ainhowe) Cross is the tallest and possibly the finest of the 37 crosses on the North York Moors. At one time, Ana Cross stood almost 8 metres high but over the years, faced with the battering gales that can sweep across these moors, has toppled over on several occasions - in fact it has only just recently been restored in the last couple of years. Starting from Lastingham Grange Hotel, we climbed gently onto Spaunton Moor, past Ana Cross to the top of Rosedale Chimney Bank for lunch where one member spotted a rare Ring Ouzel. We returned the same way to enjoy a cream tea at the hotel. Many thanks to the owners of Lastingham Grange for providing the parking and the North York Moors Rangers for their invaluable support over the last two days. From Saltergate Car Park overlooking the Hole of Horcum, we followed part of the Tabular Hills Walk into Dalby Forest. The route was flat on a good track with some potholed sections. As we were right on the edge of the escarpment, there were great views to the north over Blakey Topping (created, some say, when a giant scooped up earth thus forming the Hole of Horcum. He threw it at his wife but missed and where it landed became the curious Blakey Topping). Well, what a day! So much happened it is hard to know what to tell you. Those of us camping at nearby Wood Nook campsite had to get the three loan scooters to the start - so that was a bit of fun at 8am. Then Vic found that his Tramper had not been on charge all night so he stayed behind to get some more charge. One couple turned left instead of right and so arrived late. But all this was nothing compared to what was to come. 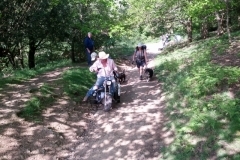 The ramble started with a visit to Threshfield Quarry which is being reclaimed and opened up to the public. Roger, an enthusiastic member of the local group, took us high up into the quarry to view the enormous hole left by the removal of the limestone. Unfortunately, this meant that we set off after a coffee & loo stop back at the cars already down to 80% battery. Malham Moor Lane is 4.5 miles straight up a 1:7 hill - which might have had something to do with our power consumption too. Entering the moor proper, our lunch stop was wonderfully situated for panoramic views accompanied by the calls of the lapwings, skylarks and curlew. Crossing Malham Moor presented little difficulty (except being more uphill) and so we arrived at Mastiles Gate where Mastiles Lane enters the moor. Here ranger Michael gave us a short insight to this ancient trackway which was used by the Romans, the Monasteries and the Drovers before being almost destroyed by 4x4 vehicles. 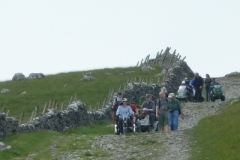 Now Mastiles Lane is a peaceful lane connecting Kilnsey with Malham for walkers. It is STEEP & ROCKY – but downhill! Our gallant band of ramblers took it in their strides down to the sheep pens where our route turned right to return to Threshfield. Before doing so, we took stock of the power left. 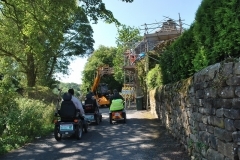 It was decided that four of the scooters had too little juice left to complete the route and so, together with one of the walkers, they continued along Mastiles Lane to Kilnsey. This meant arranging a pick-up by car and so one of the rangers set off ahead of the group to pick up her car and collect the ramblers from Kilnsey. Unfortunately she did not know the way and so ranger Michael had to go with her most of the way across the moor and then back again to be with us. This section of the moor proved to be the most difficult with steep rocky sections where John helpfully said “we are over the worst” only to find a harder section ahead. At one point a rock must have pushed itself out of the ground as one rambler found his scooter turning over sideways “in slow motion”. Help was soon at hand and both were righted with no damage to either man or machine (except for a crack in Vic’s newly restored cowl which had cushioned the fall). All the way from the start two heroines, Flora and Leslie, had been on either side of the FSU (toilet trailer) pushing it uphill and steadying it through the boulders to help conserve Liz's battery. 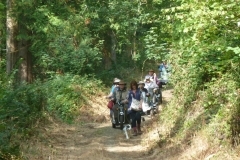 However, the power in Liz’s scooter ran out just ½ mile short of the downhill section back to the cars. So the trailer was moved to Vic’s scooter and on we went with Flora still pushing Liz’s scooter. And then came the message over the radio “The gate is locked” - and so our cars were blocked. Although the rangers had arranged with Roger that the gate would be left open, someone had locked it. Trying frantically to find Roger’s phone number produced no result and so ranger Mohammed made his way to the quarry to sort this out. In the end Roger turned up 5 minutes after the gate was re-opened by the workers who had locked it. All that remained was for John to shuttle scooters between Kilnsey and Wood Nook campsite much to the amusement of the bar staff at the pub in Kilnsey. After only another 2 hours of sorting kit out John was able to open the fridge and get stuck into a nice bottle of white wine at 9pm. Thank goodness the weather was fine! An excellent day. Many thanks to all involved. Thursday 5th June. 6.5 miles Cat 3+. 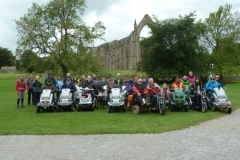 Our ramble over the Duke of Devonshire's Bolton Abbey Estate proved to be rather exciting. After braving the perils of a short section of road, we climbed up to pasture where the track became quite boggy (it was raining) and a herd of bullocks had to be moved from our path. Then up into the woods where the steep and muddy track led up out onto the start of the high ground. After pushing on into the teeth of the rain and wind for some time, we stopped for a coffee break and our Rangers decided that it was too risky to continue. So back we went through tracks even more rutted and muddy. However, it was the last section of pasture that sorted out the different machines and riders as some of the photos show. The afternoon turned bright and dry so an enjoyable ramble was had along the banks of the river. Tuesday 3rd June 5 miles Cat 3. 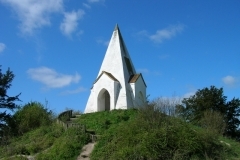 Arnside Knott is a limestone hill that rises to 159 metres above sea level (522ft). Now owned by the National Trust, the area is home to a wide variety of wild flowers and butterflies, and gave us fine views over Morecambe Bay and the surrounding countryside. Another fascinating day organised by Eileen, Andrew and Traja and assisted by several experts. 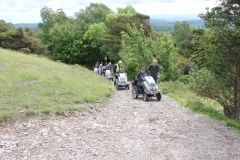 Most of us took the high road to the summit of Arnside Knott while some took the middle way to the Cowslip Meadow but all thoroughly enjoyed the day. What is the old ruin of Arnside Tower? Was it a Peel Tower or just a private home? Monday 2nd June 6 miles Cat 3 Passing through Leighton Moss RSPB reserve, some members were privileged to spot a pair of Marsh Harriers. Crossing the road we entered Trobarrow Quarry Nature Reserve, home of the first production of Tarmacadam which was used on Blackpool Front. Our team of experts were keen to point out the range of fossils on one of the faces. Then on past Hawes Water to Gait Barrows for lunch and a splendid view of the rarest of British plants -the Lady's Slipper Orchid. 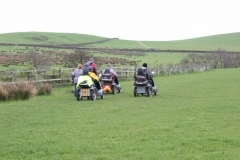 Many thanks to Eileen & Andrew of the Disabled Ramblers and Tarja from Lancashire Countryside Service and the army of experts who made today so enjoyable. 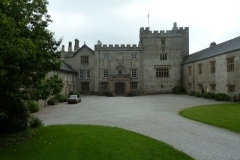 Sizergh Castle RR Sunday 1st June. 5 miles Cat 3. A splendid ramble around the National Trust estate taking in several archaeological features as well as good views across Cumbria and Morecombe Bay. Thanks to Eileen, Andrew and the NT Guide. Wyre Forest, in Wyvern (a creature similar to a dragon) is home to some of the oldest coppiced oaks in the country. 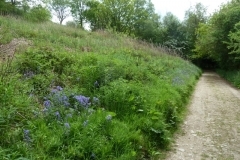 It is also home to a wide variety of wildlife including, particularly in May, woodpeckers, pied flycatchers, wood warblers, tree pipits and cuckoos. Our ramble was on forestry roads with 350ft of hill to climb. A ramble through what remains of a secret wartime air base where thousands of people lived and worked in the 1940s to enjoy a masterpiece in landscape design which was 'Capability' Brown's very first. Our circuit of the estate began with a stop at the Ice House before descending through the Evergreen Shrubbery to the Temple Greenhouse. Passing under the Dry Arch Bridge to the Lake we saw the site of the Boat House before stopping for coffee at the Island Pavilion. Sabrina in her Grotto watched as we passed on our way to the Punch Bowl Gates where we left the main part of the estate before re-joining it at the Carriage Splash, our lunch spot by Croome River. Passing the Park Seat we ascended to the ridge where we overlooked RAF Defford where RADAR was developed in WW2. Home shrubbery led us up to the Rotunda to see how its plasterwork has been saved by the use of hair nets. Then down past Croome Court and up to the Church of St Mary Magdalene where a guide told us some of its history. Finally we returned to the Visitor Centre, housed in the RAF Sick Quarters, for a welcome cup of tea – and cake! A circuit of Eastnor Estate on the Western slopes of the Malvern Hills. From the Wood Yard we went past Golden Gates lodge and climbed gently along the Ridgeway to Walm’s Well. Then into News Wood and Gullet Wood to the Obelisk. A downhill run of 400ft in a mile lead us back into the Deer Park and a final stretch across grass back to the start. 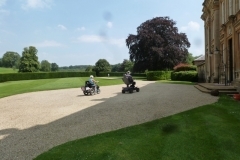 A splendid day enjoyed by all who would like to thank the Eastnor Estate for allowing us around their grounds. 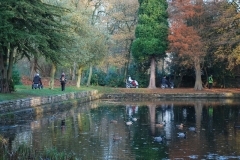 This ramble featured woodlands, lakes and waterways skilfully screening modern urban development. 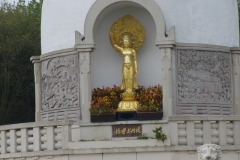 Our route meandered through the centuries, from medieval abbey lands to modern standing stones, via the famous MK Peace Pagoda. A vintage aerodrome and an agricultural college form the surprising setting for this leisurely ramble. They were preserved in memory of an RAF airman killed on a training flight in 1940, and feature on our route through wooded countryside. The Shuttleworth museum includes many working vintage aircraft and active restoration work. Over 1000 deer from nine species graze this historic parkland of 3,000 acres. They include herds of red and fallow but also the Milu deer, introduced from China in 1894 to save it from extinction. 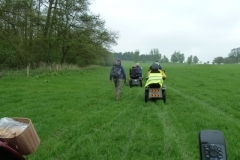 Our route takes us across their grassy plains and sheltered woodland and provides wonderful views - when the mist isn't down. However, the mist did make for a very atmospheric day. 3rd April 2014. 6 miles Cat 2. 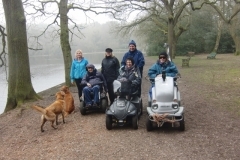 A splendid day exploring the delightful Sutton Park, a real gem that will repay numerous visits. Set in the middle of an urban landscape, the park is so large that there is no sight or sound from the surrounding area. There are no large brown tourist signs to the park and the park itself is without any signs at all. Just a peaceful oasis where the bird song is the loudest sound you can hear. 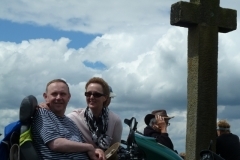 Thanks Jane for arranging a delightful day out. First Warwickshire Regional Ramble- Friday 28th March 2014 Friday dawned as a balmy spring day in the Cotswolds- a great relief after the extremes of the previous week. As we gathered in the car park of the Howard Arms in Ilmington, it was good to look forward to the first ramble of the year. 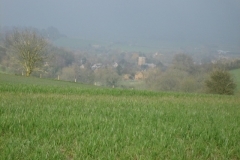 Ten of us set off through the back lanes and paths of Ilmington, a very pleasant village, enjoying the spring flowers and birdsong. A steep, and very quiet, lane out of the village led us up past fields of sheep and lambs. Although it was still misty, it was possible to catch glimpses of the fields and valleys below. From here we made our way to the Foxcote Estate, a privately owned property where Eileen, our leader, had organised access to the terrace behind the house, not normally open to the public, where we had a spectacular view of carefully tended formal gardens set against the backdrop of the Cotswold landscape. Here we had lunch, our experience enlivened by peals of thunder echoing over the valley. After lunch we made our way over muddy bridle paths and country lanes back to Ilmington, accompanied by further thunder and a rainbow. Finally we gathered for a very welcome cup of tea on the terrace at the Howard Arms, now bathed in sunshine. BURLEY, NEW FOREST, 16TH JANUARY 2014. Winter rambles are always challenging, it’s always quite an effort to make yourself get out into the cold, but this year has been so wet it’s even more difficult to get motivated – however, 5 of us did turn up for this ramble – which is usually one of the simplest there is locally, as it is dead flat being the site of an old railway track (unless you go off piste and then it is very hilly!). At 9am I did phone round to say I would understand if no-one wanted to attend, as in Hampshire we had a really torrential downpour at about that time, but everyone was en route so the ramble was on!! We met in the car park in the middle of Burley, a pretty little New Forest village, only to find part of the car park was under water – good start! Once unloaded we proceeded up the village on the pavements and partly on the road for approx ¾ of a mile, hazard lights, headlights and high viz in use, to the rather more remote car park from where we go down a little track to the old railway cutting. As you will see from the accompanying photos – there was water everywhere.